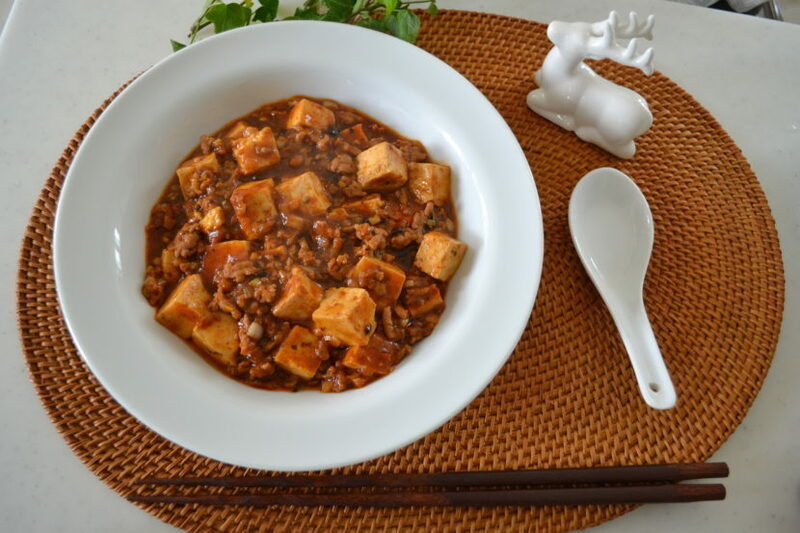 Today, I will show you how to make “Mapo-Tofu”. Requested by one of you guys! Thank you! “Mabo-Tofu” is listed in the top ten Japanized-Chinese dishes, as same as Ramen noodles and Gyoza dumplings. The Japanese version is using less spicy agents and different kind of Miso. And actually, we pronounce it “Mabo-Dofu”. I make this dish whenever I want to have spicy food. Serve it over rice or noodles;it tastes so good. Tofu absorbs all the Umami, ground pork added the texture, and the thick sauce makes all the ingredients together. Doubanjiang is the signature seasoning for Szechuan cuisine. It is a fermented hot broad bean paste, adding a hot taste. It can not be replaced with another seasoning. It is relatively common seasoning so that you can find it in an Asian grocery store. And to make this dish more hot, we use hot pepper powder. But I prefer not too spicy finish, so I replaced half with paprika powder. If you want to make it hot, use all hot pepper. Szechuan peppercorn powder is never skippable seasoning to the dish. Szechuan pepper adds numb flavor to the dish. But we use Japanese pepper instead. It has a numbing effect of opening your taste buds as well. This seasoning brightens all the flavor, so I add it to the last touch. Do not use too much otherwise your taste buds will be numbed and taste nothing! Dou-chi is fermented black beans. This fossil like seasoning adds deep flavor to the dish, but you can skip it by adding more Miso . 1 firm tofu (400g) ※You can use silken tofu but it will lose its structure easily. 1. Pour hot water to chicken powder to make chicken broth. 2. Mince garlic, ginger, Japanese long green onion and Dou-chi. 3. Cut tofu into cubes. Simmer in salted water until heated through. This step remove excess moisture of tofu and make it easy to absorb the sauce. 4. Mix potato starch with water. This is going to be a thickening agent. 5. Fry ground pork over medium-high heat, break up and cooked through. Add minced garlic and ginger, Stir until fragrant. 6. Reduce the heat and add Doubanjiang and Dou-Chi and fry until evenly distributed and the oil changes its color to red. It will take a minute or two. 7. Add hot pepper powder and paprika powder. Paprika powder adds a beautiful color and flavor without adding any spiciness. If you have kids, reduce the amount of hot agent. 8. Add miso and sake and soy sauce and mix to well distributed. Add sugar to moderate the flavor, and Japanese long white onion. 9. Add your chicken soup and bring it to a boil over medium-high heat. Taste before adding tofu. If it tastes good, add drained tofu and simmer for 5 minutes. 10. When your tofu absorbs the Umami, stir in the starch water in two. Stir constantly to evenly thickening the sauce. Be sure not to break tofu too much. 11. Bring it to a boil again, and sprinkle with sesame oil. And it’s pretty much done! 12. Transfer to a serving dish, and sprinkle freshly ground Japanese peppercorn aka “Sansho” to the last touch. Serve immediately. It goes so well with rice. Tastes so good. Another way to enjoy Mabo-tofu. Put cooked ramen noodles into a bowl, sprinkle with chicken broth powder, sesame oil and soysauce and mix well. Pour over Mabo-tofu and mix well. And Enjoy! It’s getting colder, hot food warms up your body from inside. So give it a try and be in good health!